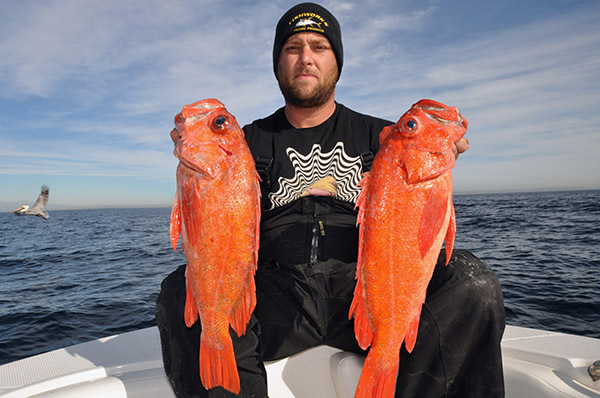 The combination of depth and tackle restrictions and the availability of braided lines have completely changed the way people fish rockfish. 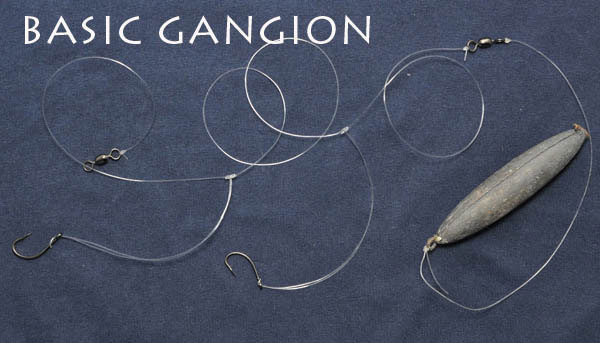 Long gone are the days of using 9/0-sized reel and heavy rods to drop five-pound sinkers trailing multi hook gangions in 600-feet of water. With the 300-foot depth limit in California waters and a two hook maximum, you can comfortably get by fishing with light tackle. 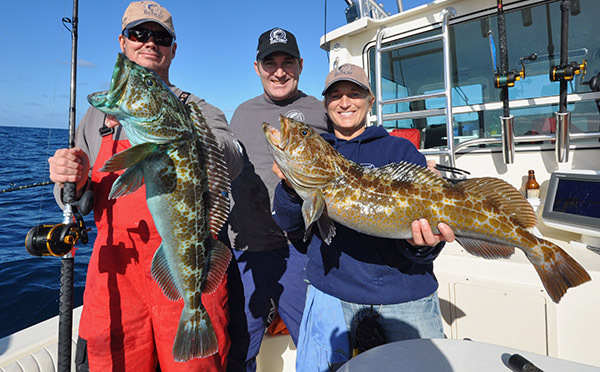 These three rods will cover any rockfishing situation you’ll encounter in Southern California. 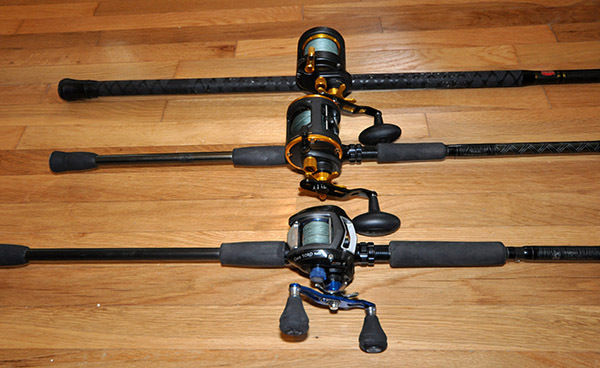 The bottom combo is an Abu/Garcia Revo Toro 50 NaCl filled with 65-pound Stren Sonic Braid and mounted on Rainshadow ISWB 946 (which is an 8 foot medium heavy bass rod). This combo is perfect for fishing at depths up to approximately 150-feet; making it my go to rig when fishing within the Cowcod Conservation Area around Santa Barbara and San Nicholas Islands. 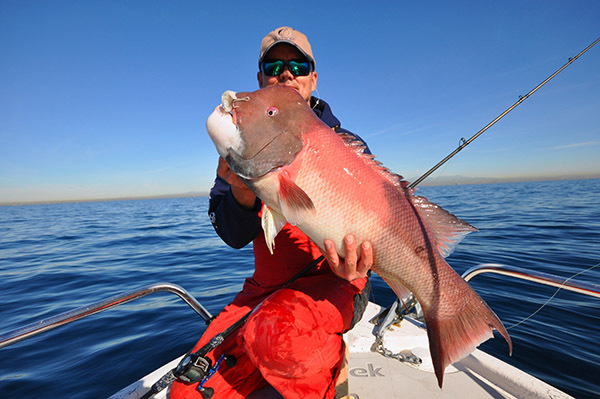 With the maximum allowable fishable depth being 120 feet, there is no reason to fish anything bigger. This combo gets a ton of use on my boat and considering we’ve caught multiple ling cod and sheephead over 25 pounds on it, it’s proven that it can handle big fish. Preferred rigs on this combo would be a single dropper loop with live or fresh dead squid, a heavy jig like the 4 or 6 ounce Ahi Assault Jig, or a swimbait on a 2 to 3 ounce lead head. The middle combo features a reel that was just released this year. It’s a Penn Squall 15 Level Wind full of 50 pound Stren Sonic Braid matched with a Rainshadow ISWB 947 (which is an 8 foot heavy bass rod). Though not much larger than the Toro, this reel holds over 300 yards of 50 pound braid which means you’ll have plenty of line to fish up to 300 feet. The reel also features an oversized handle, which will give plenty of cranking power to get those fish up from the depths. This is my general use bait rod and will always be rigged with a 2-hook gangion and a 10 to 16 ounce torpedo sinker (depending on depth and speed of drift). The final piece to the puzzle is my jig / big bait combo. I fish a Penn Fathom 25N full of 80-pound Stren Sonic Braid rigged on a Penn Carnage 800M. This combo is used for fishing jigs, like the 8 to 12 ounce Ahi Assault Jigs, in water deeper than 150 feet. I’ll also use it to fish bigger baits, like mackerel or sand dabs, for ling cod. 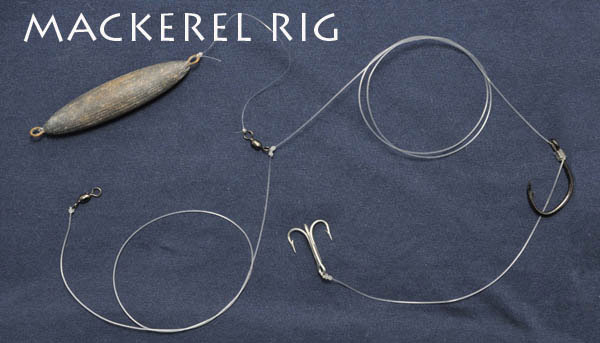 Click here for an explanation of how to tie these different rigs.